Below are tutorials and videos on various aspects of utilizing MultiForm to its fullest. We will be adding new tutorials continuously. Our most recent addition is on bringing MLS Comparable Sales and Listing information into your BPOs (Broker Price Opinions), and Monthly Marketing Reports, and any other form that has a comparison grid. This feature can benefit you greatly by increasing the speed and accuracy of your forms completion. These tutorials may be viewed at your convenience. From time to time we also have introduction and training classes of various aspects of the power of MultiForm. Check the course schedule to see if there is a course of interest. Virtually every MLS around the country is different. Data is stored in every imagineable way. For instance, some MLSs have fields that group all related items like exterior amenities spelled out into a single field; some have a separate field for each amenity, some of those use a "Yes"/"No" for the data in an amenity field, and some may use "True"/"False"; some have codes for said amenities in a field like this: "A,C,H,K,R". There is some MLS data that can be used in a one to one relationship on a form such as the Fannie Mae Single Family BPO. However, that and other forms may have special requirements for data presentation that may not exactly match how data is stored in an MLS. The code "A" for a data item will not mean much on the form unless it is transformed into what it actually means like "Colonial". 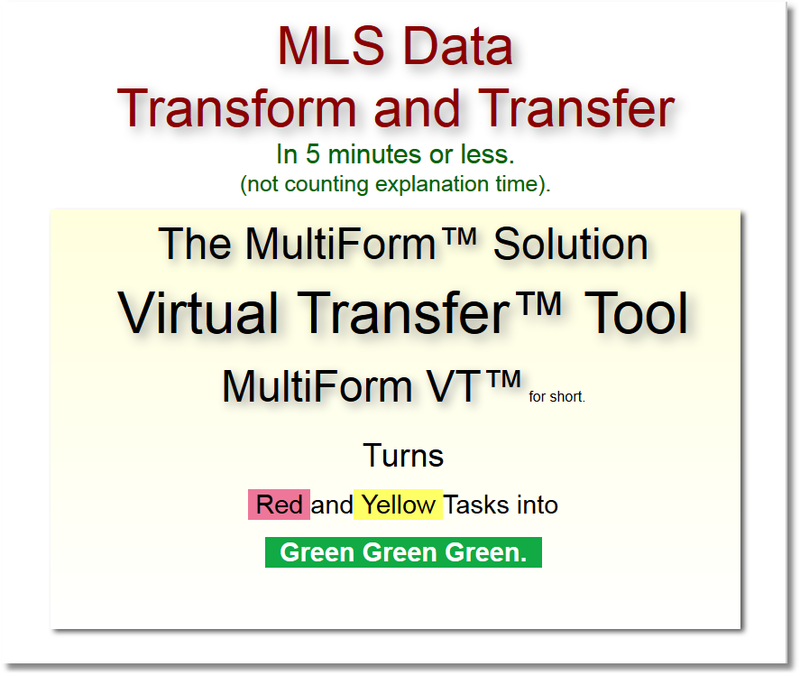 Thankfully, MultiForm has the abilities to make data transformations, so the most data from your MLS can be used with your forms, increasing the accuracy of your work. This video shows the importing of MLS data into MultiForm forms. An MLS search will have been completed, and the data exported to a tab or comma delimited file. An MLS Export Definition will have been setup to specify which fields to export. A MultiForm Import Map will also have been previously completed that specifies how the MLS data is to be fit into a form such as a Broker Price Opinion's Sales and Listing Comparison Grids. This video picks up at MultiForm importing the data that has been exported from MLS. Productivity is paramount. Typing things more than once is not productive. Typing things more than once means less time for accuracy and analysis. Below are some videos showing how you can be much more productive and accurate with your Fannie Mae forms. This video will show how to prepare an updated MMR (Monthly Marketing Report) in 5 minutes by reusing data from a recently completed BPO. This BPO has the most recent comparable information in it because it was just recently completed, and its data is still relevant to the current MMR. There is also information on the previous MMR that would still be relevant and would be productive to not have to rekey it. From the previous BPO, fetch its Comparable Sales and Listings. From the previous MMR, fetch any data not brought over from the BPO. From MLS, overlay any newer comparables. Now you have the time to look at the details and thoroughly compare and analyze the properties. This video will show how to prepare an updated BPO (Broker Price Opinion) in 5 minutes by reusing data from a recently completed MMR. This MMR has the most recent comparable information in it because it was just recently completed, and its data is still relevant to the current BPO. There is also information on a previous BPO that would still be relevant and would be productive to not have to rekey it. From the previous MMR, fetch its Comparable Sales and Listings. From the previous BPO, fetch any data not brought over from the MMR. 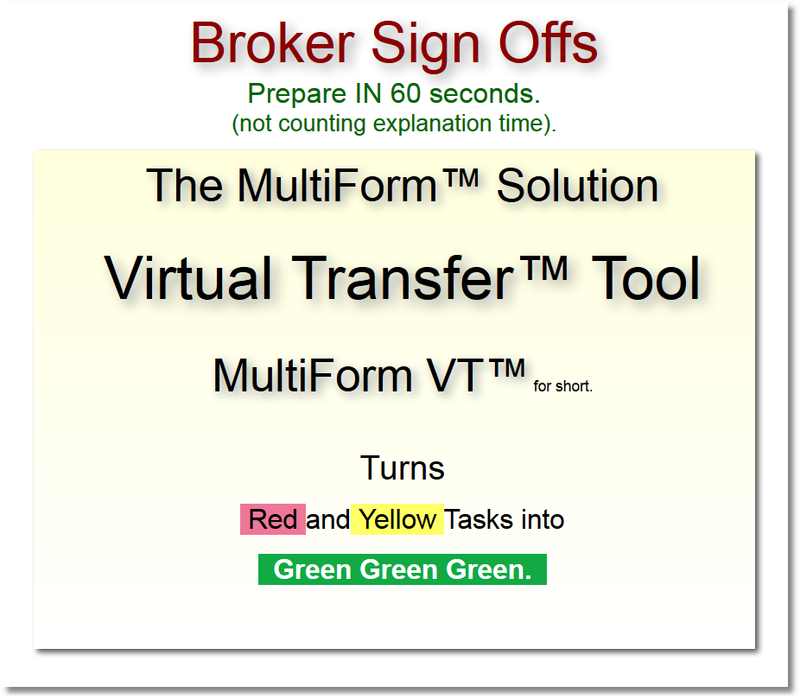 This video will show how a Broker Sign Off can be reduced to a just few clicks instead of 200. For those common situations where a Broker Sign Off might have a particular set of answers, like a property in excellent condition and ready to be marketed, or a property in average condition and has not yet been cleaned, or a property in poor condition, a Broker Sign Off can be pre-fashioned with answers that fit those typical situations. The saved condition can be fetched into a new report and then adjusted to the particular property's condition if need be, reducing hundreds of clicks to just a few, and you still have the exact same report you would have with 200 clicks. This video will show how to import Sales and Listing Data into your BPOs and MMRs, saving enormous amounts of time, and adding room for accuracy. This video will show how to prepare an updated MMR in 5 minutes by reusing data from a recently completed BPO that has data that is relevant to the current MMR task (esp. 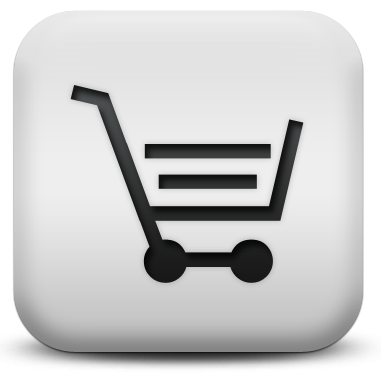 sales and listings). 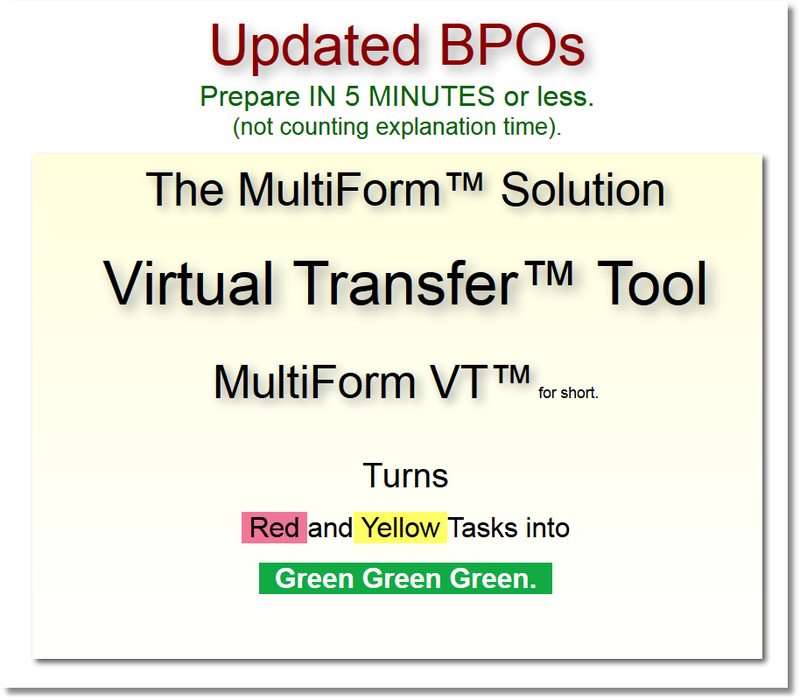 This video will show how to prepare an updated BPO in 5 minutes or less by reusing relevant information that has already been entered in a previous BPO and a previous MMR. This video shows how a Fannie Mae Broker Sign Off form can be prepared and completed in about 60 seconds. Reduce 200 clicks to 2. 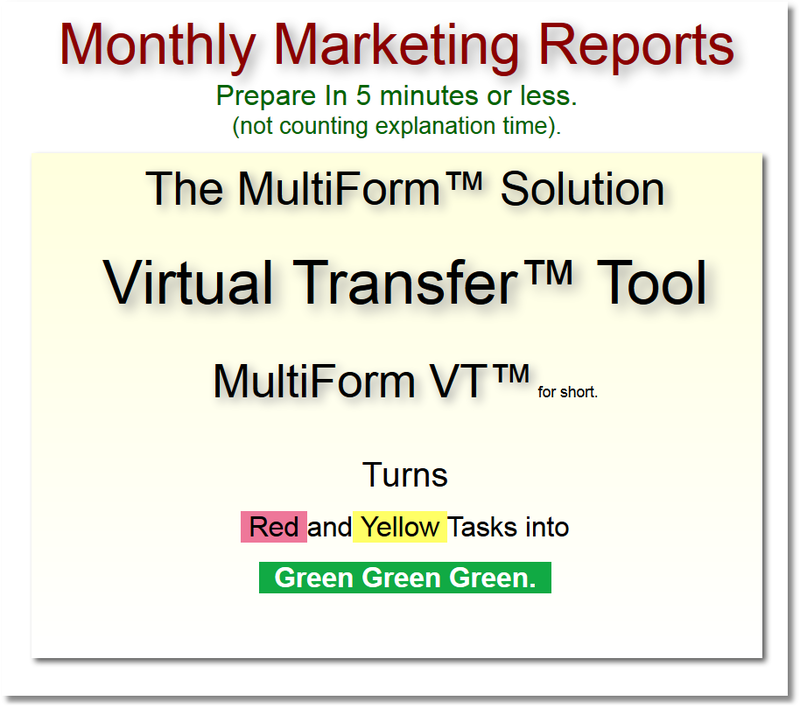 To order MultiForm VT™ (Virtual Transfer Tool) and for more information call our customer service desk.